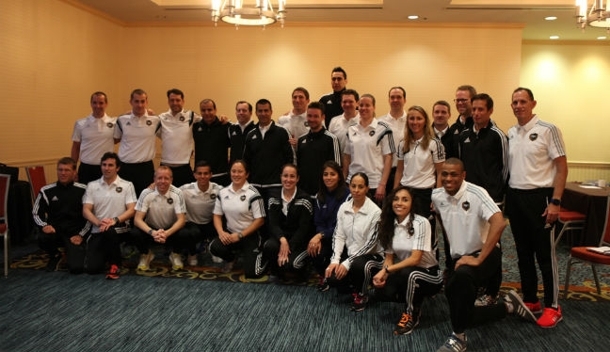 PRO’s Referee Manager Michael Kennedy has described the first PRO Training Camp of 2015 as a ‘great success’. All PRO officials and support staff attended the camp, which was held in Pasadena, California and the theme of the weekend was ‘working together’. 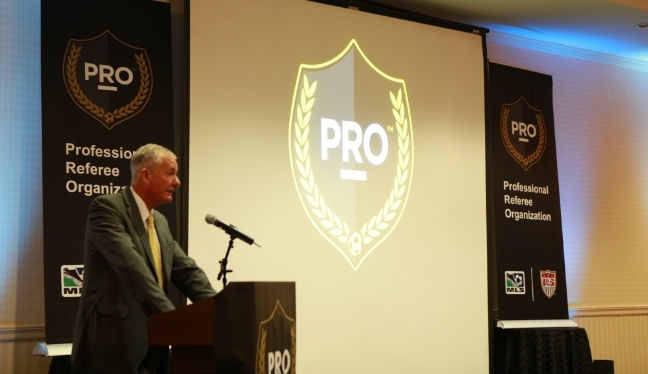 FIFA, CONCACAF, US Soccer and PSRA were all represented at the camp and the importance of a successful collaboration between the organizations was reiterated throughout the event as a key driver for PRO this year. Kennedy told proreferees.com: “Our 2015 match officials made the preseason camp a great success by arriving physically fit, prepared to participate and excited to meet the challenges ahead. “You could see by the officials’ professional approach to the seminar that they realize there is a lot of hard work ahead and to be at our best it demands a total team effort. The sessions at the camp covered various topics including a review of 2014, with Kennedy and Rejer discussing major learning points, and a look ahead to 2015 – outlining new initiatives, namely dissent and persistent infringements. Sports Scientist Matt Hawkey put the officials through their paces in a series of fitness tests, and discussed nutritional preparation alongside Sports Nutritionist Gena Wollenberg and Andy Bosak. Sonia Denoncourt, CONCACAF’s Director of Refereeing, also addressed the camp, reinforcing the benefits of improved cooperation and speaking of her hopes and aspirations for the future. There was a discussion and clarification about the new offside law interpretation with Paul Scott and Craig Lowry, and FIFA World Cup senior instructor Hector Vergara spoke at the camp about dealing with dissent and positioning on the field. The 2015 FIFA badges were awarded to all the worthy recipients and presentations were made to Juan Guzman and George Gansner after their FIFA retirements. 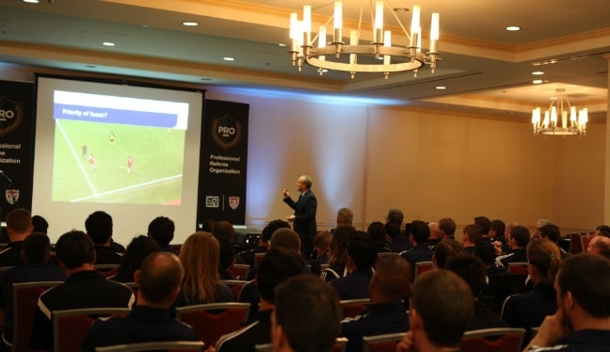 PRO’s World Cup officials Mark Geiger, Sean Hurd, Joe Fletcher and Eric Boria also gave a presentation, reflecting on their experiences at the 2014 World Cup in Brazil. Rejer formally closed the proceedings at camp by wishing all officials and support staff well for the season ahead, reinforcing the ‘working together’ message.